Take the role of Miss Black, a whip-smart policewoman who's out to make a name for herself, in Profiler: The Hopscotch Killer. With the help of a grizzled veteran detective, you must find the clues that lead to the guilty parties in several horrific murders. Use your Hidden Object skills to catch the crook and climb the ranks! 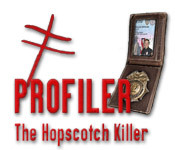 Bring the terrifying killer to justice in Profiler: The Hopscotch Killer!